allowed them to rival many an ancient civilisation. A nation founded upon the exploits of Sunna, goddess given flesh, our ally has developed far from its early days. The tribes Sunna unified have endured together, never forgetting her memory and glory, symbolised by her eponymous sword Sonnstahl. The core of human supremacy in Vetia, with Destrian wealth now united through marriage with its grand armies and economy, there is no limit to the Empire’s ambition. But, to command such a diverse nation, an Emperor must not simply conquer in battle, he or she must compete in the political arena, navigating the treacherous currents of rival families and churches, to unite the nation against its enemies. A true seat of learning, with magic and technology refined into effective weapons, the Empire has become a master of many trades and has begun extending its grasp to foreign lands. “Brothers and Sisters of the Goddess! I salute you in victory! Today the work of Sunna is begun. The enemies of humanity are vanquished - the first of many to fall before her bright flame. Long have heroes among us searched for the Sonnstahl that was lost to us, but today I tell you truly: it is no longer a sword! We are the Sonnstahl - humanity united, the great arm of the Goddess herself! Today the peoples of vetia have stood and declared their ascendancy and their intention to drive back the darkness and rule this world. Today our peoples came together to forge the true Empire of Sonnstahl. Today we become Sunna’s righteous army! So spoke Leopold Truehearted when the Empire was founded at the conclusion of the war against Dathen. A date known to all Sonnstahlers: [December] 4th 201 A.S. Since then, a long line of Emperors has remained true to Leopold’s holy vision, each chosen in turn by the distinguished council of electors. Today Sonnstahl is ruled by Emperor Matthias, who they call Pious. I could not win an audience with his holiness, son of Frederick the Great, but I was received by Princess Josefa, a great honour. Matthias’ elder sister, she should have been Empress, but was given into Sunna’s service as a child, to secure her brother’s strategic marriage to Sophia of Destria. 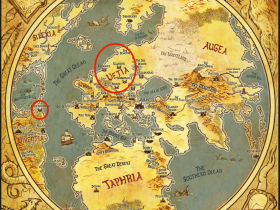 The alliance is the most formidable in Vetia, if not the world. Some whisper that Josefa still has her ambitions set on the throne, though she claims to support only the proper supremacy of the Church. From her piercing questions on my work and travels, it is clear she is far from removed from courtly intrigue. My eternal service to Your Noble Ladyship! My thanks for Your sharp letter of guidance; I will deliver to Your Ladyship the articles essential for Your continuing and glorious efforts in defending Your land’s end from the hideous enemies of Man. I bear glad news of my humble progress with the barding to Your son Sigmund’s magnificent horse. Master Oethbert has completed the etchings on the plate, and the maidens under Lady von Ribbingen have made good process with the textile covering the hind part. Of the 60 breastplates to Your Ladyship’s foot knaves I must tell that the first dozen did not meet the high standard suitable to You – a full half of them were penetrated by the test shots I fired with the very special pistol You gave me for the task. Master Schultzer was devastated and begged my mercy and Yours, and promised a better party within four weeks with no extra expense. Of the 200 handguns, Your Highborn Ladyship should know by now that I have sent them via Arnfurt and Dürrenburg, in order to save You from the excessive tolls collected by His Lordship, the Count of Scharland. Further, it should be known to Your Ladyship that no coffee nor chocolate could be found in here, neither in the town nor in the district - trade with Virentia being hampered of late by Arandai levies. But I have explained the demand and taste of Your Ladyship to my factor in Alfhaven, and will do my utmost to bring in person the best produce to Your hands when I return.